It doesn’t matter if you can actually sing, there’s something incredibly fun about belting out your favorite tunes at the top of your lungs—especially if there are a few beers involved and you’re surrounded by a group of friends. That’s what you’ll get at the awesome karaoke bars of New Jersey. Here are our favorites! Rooster Spin is a restaurant and karaoke bar serving up yummy Asian cuisine such as bao, ramen, bibimbap, and more. Enjoy their popular private karaoke rooms where you can sing with a group of friends, order off their flavorful menu, and sip on hand-crafted alcoholic beverages. Rooster Spin has two locations in New Jersey and each location has rooms of various sizes. Georgies is the hottest gay bar in the area and the bar features an abundance of weekly events. Every Wednesday and Saturday night from 10 pm, partiers can join in on the karaoke dance party hosted by DJ Ted D’Bierre. This karaoke is excellent as it has no cover, thousands of songs to choose from, and drinks specials are available until the bar closes. Free parking is also available. 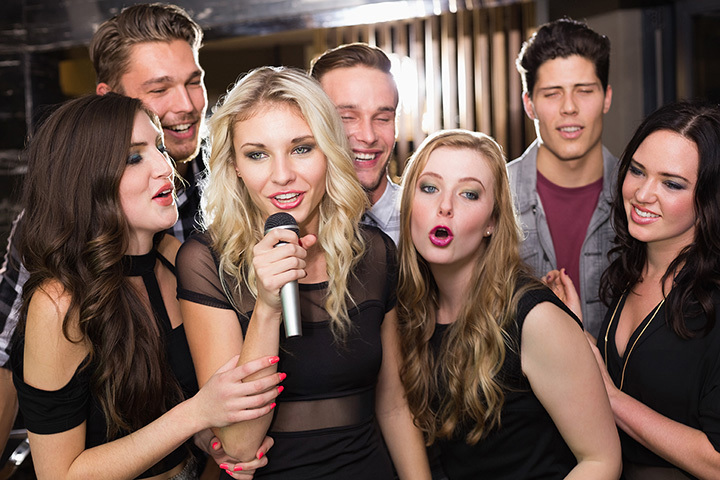 Volume Up Karaoke provides a selection of clean private rooms for you to karaoke with your friends, which makes it perfect for private birthday parties or other celebrations. As the space doesn’t have a bar or kitchen, you are encouraged to bring your own drinks and food. If you plan on visiting on a Friday or Saturday, be sure to call ahead to reserve your karaoke space. Libretti’s has been serving homemade Italian food since 1950, and though it is under different ownership, it still has classic Italian dishes on the menu. Aside from the excellent menu, the atmosphere comes alive every Friday and Saturday night from 7:30 pm to 1 am, with its weekly karaoke dance party. Arrive early for a hearty dinner and then cheer on fellow diners when they take the mic. Decked out in proud Irish colors, Wild Rover pub offers ample entertainment for any visitor. Karaoke is offered every Thursday night and open-mic night is held every Sunday night. Even if you don’t plan on singing, these events are great fun to attend to listen to local talent and cheer on brave friends who stand up to perform. Whether you’re partying in Tokyo, New York City, or Atlantic City, you can count on Planet Rose to provide a fun karaoke venue suited to young clientele. In Atlantic City, Planet Rose is located in the Tropicana Casino and Resort and stays open late (3:30 am on Fridays and Saturdays) to give everyone the chance to sing their hearts out. The full bar on site can also mix up some liquid courage. Swing by on a Saturday night to sing today’s best songs at Mikey’s sports bar. This weekly event allows partiers to enter with no cover and offers discounted drink specials, making karaoke night an affordable and fun night out. While waiting for your turn at the mic, order a helping of their famous wings and wash it all down with a drink from their full bar. Time Karaoke bar provides a selection of private rooms available for parties to get together for a fun night out. Each room is clean and has a karaoke system stocked with a variety of songs to please every soulful singer in your group. They also have a small selection of food available in case you need some fuel to continue belting it out. This long-standing family owned bar and grill is a cool venue for weekly karaoke, as it was converted from a former gas station and is decorated with beer signs, antiques, and even cars. Karaoke is offered every Wednesday night—so if you’re looking for a mid-week break, this’ll be your best bet. The Orange Lantern also has a menu full of tasty American options including burgers, sliders, pizzas, and sandwiches. Grab lunch, dinner, or another drink in the comfortable surroundings at Blitz Sports Bar. In addition to showing sports on their many big screen TVs, Blitz Sports Bar offers karaoke night events throughout the year, which is a perfect way for visitors to shake things up during a regular night out and even get out of their comfort zone. View more New Jersey Bars and Saloons.